New Zealanders, colloquially known as “Kiwis,” are a famously friendly and happy people. The culture in New Zealand allows for serious work-life balance and residents enjoy incredible social rights. Kiwi women and men have truly equal status, and gay marriage is legal and widely accepted. New Zealanders are well educated, both in school and from highly encouraged global travels. Perhaps most importantly, the country’s natural landscape is truly stunning, regardless of whether you’re living in proximity to the Southern Alps, Marlborough Sounds, Coromandel, Mackenzie Country, Otago or Canterbury. With that being said, regardless of whether you’re moving to New Zealand for a new job, to start company, or just to try out a new way of life, it’s important to understand how you can stay legally, and what it means to become a citizen. This guide will walk you through the most important aspects of applying for New Zealand citizenship, and what the applications of that citizenship are. What’s the difference between residence and citizenship? Realistically, the difference between a permanent resident and citizenship in New Zealand is more or less non-existent. Permanent residents can vote, travel at will and have access to the same governmentally-subsidized social programs (like education and healthcare) that citizens do. As such, the main benefits to citizenship in New Zealand are securing a sense of national identity, a “security of tenure,” or lack of risk of having a visa revoked, and the right to a New Zealand passport. Many expats in New Zealand do choose to live in the country for many years without applying for their citizenship, as the difference on a surface level is nearly indistinguishable. If you’re ready to feel like a real kiwi, however, applying for citizenship is the way to go. There are a number of different ways you can obtain a New Zealand citizenship, the first of which is going through the application process. If you have lived in New Zealand for a minimum of five years, you’re eligible to apply for citizenship. In order to become a citizen you must intend to continue living in New Zealand, you must speak basic English and you must be what the government calls “of good character” (this means that you must pass background checks). It doesn’t matter what kind of visa you had while spending five years in New Zealand - you could even have had more than one type of visa - just as long as it has allowed you to legally live in New Zealand for the duration of the time in which you have been living in the country. If you’re found to have been residing in New Zealand illegally or have overstayed your visa, you’ll be denied citizenship and will face deportation. Not only must you have been living in New Zealand for the past five years in order to obtain citizenship, you must also have spent a requisite amount of time in the country during those five years. If you were outside New Zealand for four months during any one year, that year won't be counted towards your citizenship. If you’re applying for citizenship as an adult or for your child, you must complete the application, present your birth certificate (or your country’s equivalent), your current passport, two identical photos of yourself (in color) and someone to act as a witness. Your witness must be over 16 years of age and must have a valid New Zealand passport. There’s a fee to apply using this method - NZD 470.20 for each adult application and NZD 235.10 for each child application. If you’re receiving funding for the citizenship process from your account back home, use TransferWise to get the real exchange rate and cut out expensive international bank transfer fees. Once you’ve completed the application, paid your application fee and sent in all your required documents, all that’s left to do is wait. Copies of your passport and other legal documents will be shipped back to you within two weeks. If your application for citizenship is successful, you’ll be notified six to eight weeks after you apply. If there’s a problem with your application, you’ll be notified by mail. The final step of this type of application is to take place in a citizenship ceremony. All adults must attend a public ceremony - where you’ll be formally welcomed as a Kiwi - to get citizenship. During this ceremony you’ll read a statement aloud to the room, stating your loyalty to New Zealand. You may either read aloud an oath (which holds religious connotations and includes the phrase “so help me God”) or an affirmation (non-religious). 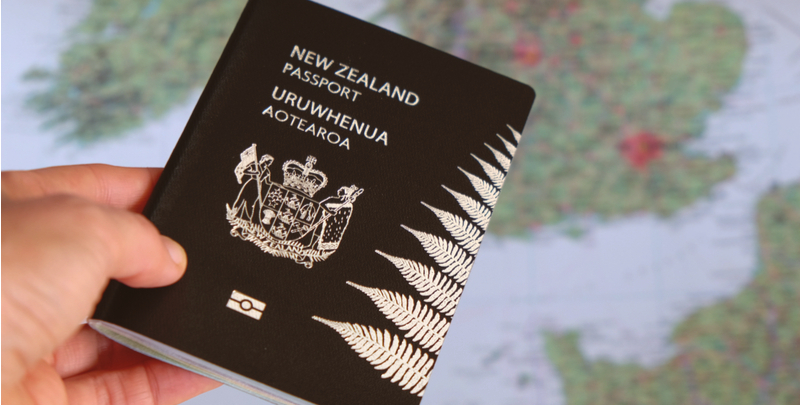 As soon as you complete your ceremony you’re eligible to apply for a New Zealand passport. There’s a separate application for Samoans - the application is more or less the same, however some of the legal documents required are different (for example, you must present your citizenship card with your application) and there are a few differences in requirements. Samoans don’t need to speak English or prove they’re of good character in order to be granted citizenship. Samoans also don’t have to intend to live in New Zealand once that citizenship is granted. If one or more of your parents are a New Zealand citizen by birth or by grant, but you were born outside of New Zealand, you can apply for what's called “citizenship by descent.” The parent must have been a citizen prior to your birth in order to be eligible. If you’re granted citizenship by descent and have children who are born overseas, your citizenship won't be passed on. Another way to obtain a New Zealand Citizenship is to marry a citizen, also known as a Kiwi. The application process is the same as above, however, you must apply for a visa to live there (even if you’re already married to a New Zealand citizen). The “Partner of a New Zealand Resident” visa requires your partner to support your application. This means your partner must fill out an application and send in any necessary documents (such as their New Zealand passport). You’ll then have to complete a ‘Residence Application” form, and finally you’ll need to travel to New Zealand. The fees for this type of application vary in certain parts of New Zealand, but you can check how much you’ll have to pay using their fee finder. Can I Have Dual Citizenship? How? New Zealand does allow dual citizenship, but whether or not you’re eligible depends on the country where you’re currently a citizen. You must check with your home country’s government to determine whether or not you’re eligible for dual citizenship with New Zealand. There are some tricky rules about giving birth in New Zealand - if you or the other parent is an New Zealand citizen or permanent resident and your child is born in New Zealand, your baby is automatically a citizen. However, if you’re from a country that doesn’t allow dual citizenship and your baby is born in New Zealand, they might not be able to give up their citizenship until they turn 18. If you want your baby to be a citizen of your home country, you’ll need to return home before giving birth. There are many ways to become a citizen of Kiwi Country, but to obtain a New Zealand citizenship there will always be costs involved. If you’re funding your journey to citizenship from your bank account back home, it’s important to protect yourself. Use TransferWise to get the real exchange rate and cut out expensive international bank transfer fees. Good luck on becoming a citizen!